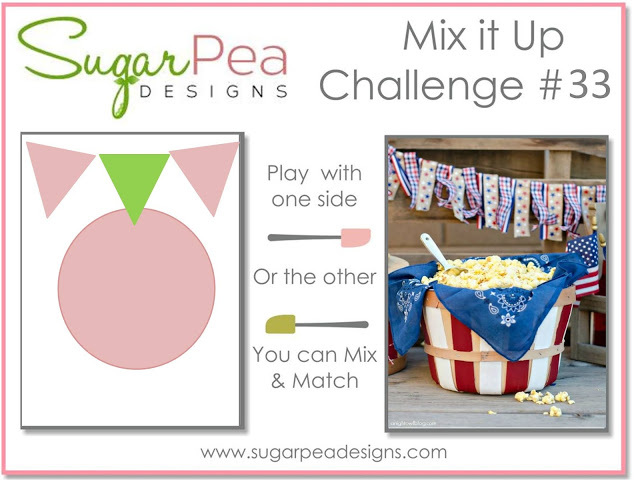 Today's card was inspired by the July Mix It Up challenge from Sugarpea Designs. 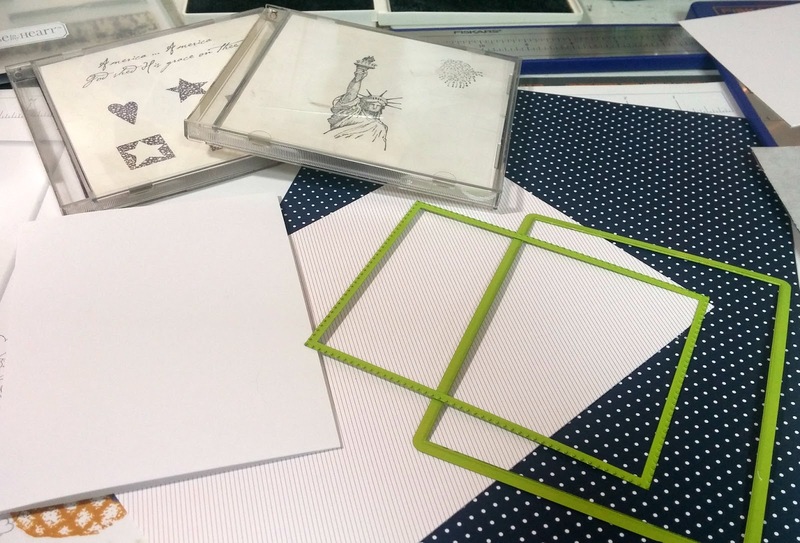 I will also be entering it for the "Liberty Quote" challenge @ Words 2 Craft By, for the color challenge of "Red, White and Blue" @ Paper Play Sketches and for "Where in the World" @ the Sisterhood of Crafters blog. For this card, I started with a white side folding A2 size card base and gathered some patterned paper from my Amuse Studio collection...a thin red diagonal stripe and a navy polka-dot. I gathered a mix of retired stamps from The Angel Company and 2 rectangle dies from Fun Stamper's Journey. I used both dies at the same time to cut and pierce the red striped paper, backed it with the navy polkadots and adhered them to the card front. 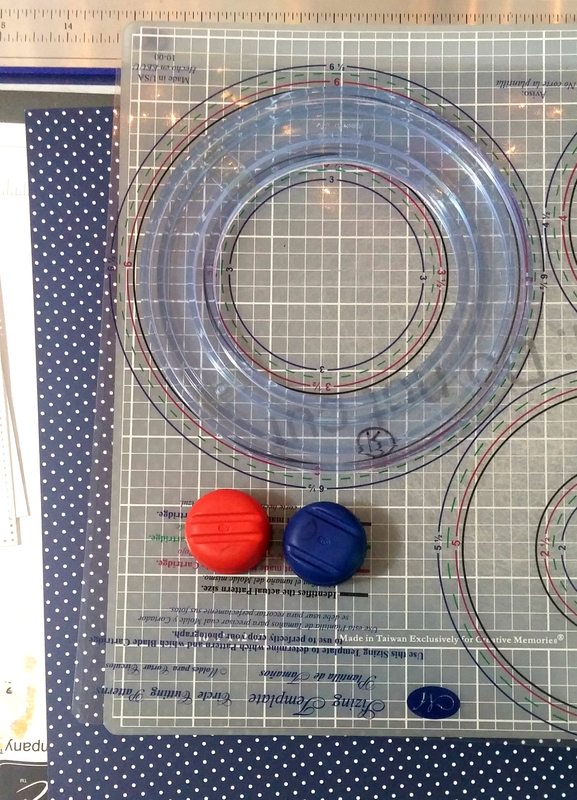 Next up I knew I wanted a circle shaped frame, so I used 2 different colors of my CM trimmer blades (red and blue) with the same circle template on the navy paper...cutting the smaller one (blue) first is the key to making this work. 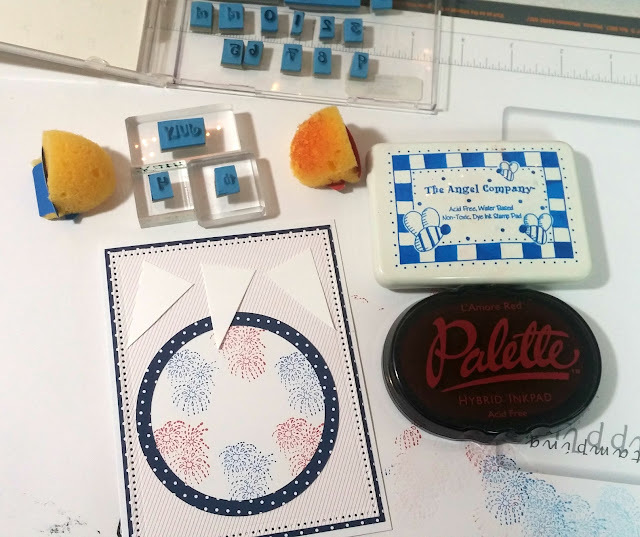 Since Amuse Studio paper is patterned on only one side and white on the other, I was able to make use of the inner circle by turning it over and using the white side to stamp fireworks on in blue and red dye inks. 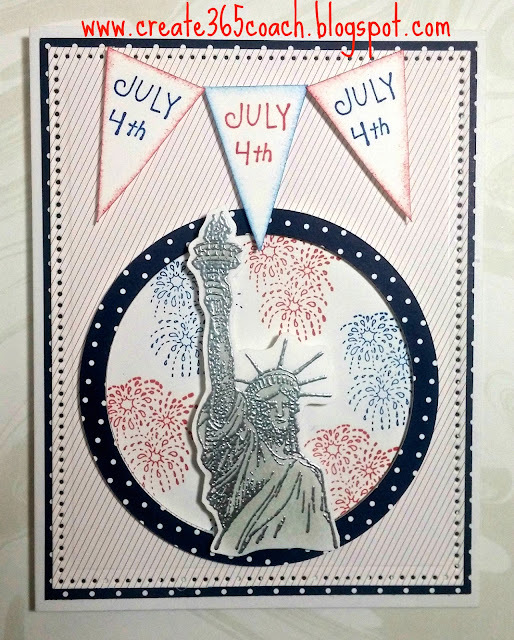 I hand cut the banners according to the sketch, edged them in inks by using the quartered sponges and stamped them with "July 4th" using a tiny calendar set from TAC. 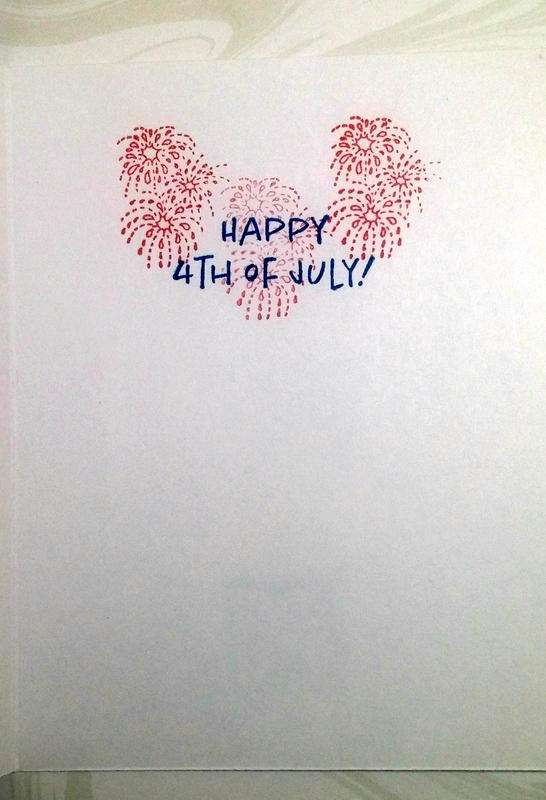 I used mini foam dots to mount the navy circle frame near the bottom of the card and then adhered the white fireworks circle flat in the middle. 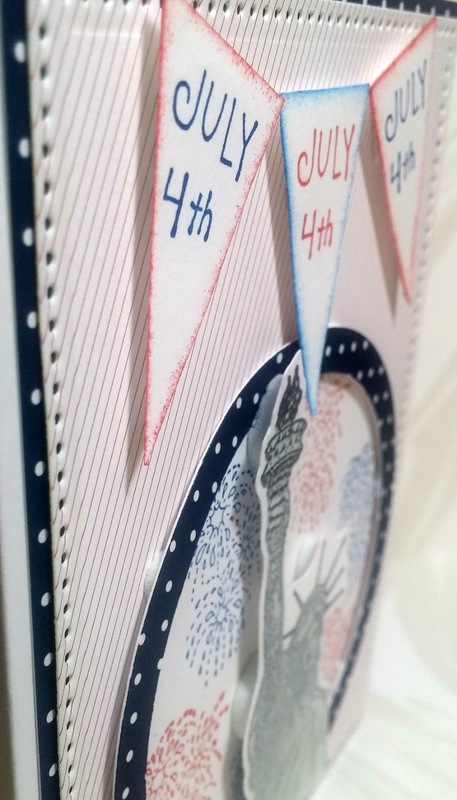 I used regular foam squares for the banners and planned for extra dimension foam circles to adhere Lady Liberty so that she would stand out above everything else on the card front and take center stage. 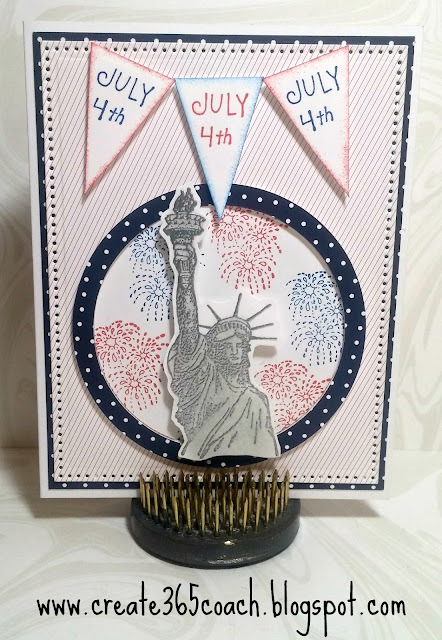 Lady Liberty was stamped and embossed in silver on to a white scrap of cardstock, colored with art chalks and fussy cut out before popping her up to finish off the card front. 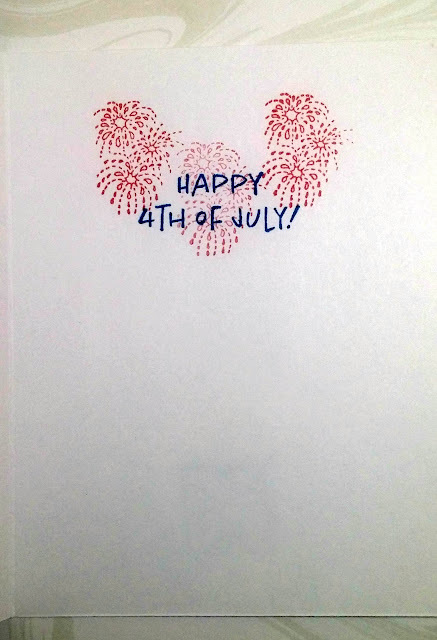 The inside I kept clean and simple by stamping fireworks in red for several "ink generations" and then over stamping "Happy 4th of July" in blue ink. I was really pleased with how this card turned out, even if I am a little late in celebrating Independence Day here on my blog, lol! Fabulous card and great 4 of July card, thank you for joining our challenge at The Sisterhood! Just beautiful Kathy! God Bless America! Thanks so much for joining us at The Sisterhood’s ‘Where in the World’ challenge and please come back again soon! Wonderful design, Kathy! It's never too late to celebrate freedom. Thanks for joining us at the The Sisterhood of Crafters Challenge. Kathy a wonderful patriotic card. Thank you for sharing with us this month at SugarPea! I'm all about the red white and blue! Love the Card! Beautiful image and card! Thank you for sharing with us at The Sisterhood of Crafters. Love the layers and dimension on this beautiful card! 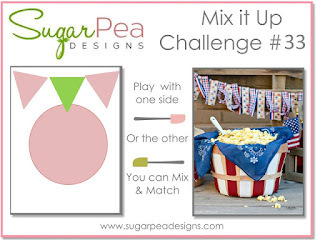 Thanks for joining us at SugarPea Designs!